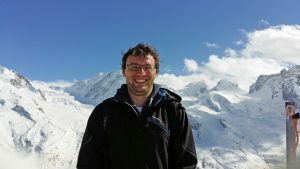 My research focuses on modelling ice flow using modern parallel computer architecture. One of the big challenges in glaciology and geomorphology is to understand the processes that take place on ice bedrock interface. Today, ice surface velocity can be measured at unprecedented resolution using satellite or airborne measurements. However, ice velocity measurements at the base of glaciers are scarce primarily because of the limited access to the glacier beds. Therefore, constraining the ice velocity at the base of the ice sheet or glaciers still remains challenging for the ice flow modelling community. The highest uncertainties arise from both the poorly known parameters like the basal friction coefficient and rheological parameters. Furthermore, motion and dynamics of ice sheets and glaciers are strongly coupled and nonlinearly dependent on the ice temperature field, itself a function of the actual ice velocity and stress distribution within the ice domain due to the ice advection velocity and viscous deformation mechanism. In my PhD thesis, I investigate the extent to which this strong nonlinear dependence of the ice viscosity on the ice temperature may impact estimates of basal conditions. The topic of my PhD is modelling ice flow by developing numerical models that utilize graphic cards (GPU’s) and also to investigate influence of various physical processes, for example strain heating, on the ice flow and glacier erosion. In my studies, I use our recently developed three dimensional multi-GPU thermo-mechanically coupled Stokes solver that takes into the account all the advantages of a modern GPU parallel architecture. Our model uses an iterative finite difference method based on the dynamical force balance equation and artificial compressibility method. All equations are discretized on a regular staggered grid. To efficiently solve the coupled momentum and energy system of equations we have ported our code to C-CUDA and utilized the speed up potential of computer graphic cards (GPUs).